Bring espresso, water and sugar to a boil, whisking until sugar is dissolved. Whisk in cocoa and continue to whisk until thickened. Allow to cool. Can be made and refrigerated overnight prior to serving. There comes a time in everyone's life when it is necessary to have gelato for lunch. For me, that time is August. Also known as the month of the momentous occasion of my birth, August is one of the most humid, hot, sticky and downright icky month of Baltimore summer. One barely wants to go outside to pick herbs much less garden or enjoy one's hammock. Even walking to the corner for a snowball seems arduous. No, it is better spent sitting in front of your room air conditioner in your non-centralized air conditioned home and eating gelato (or ice cream or frozen yogurt! I don't judge) and watching British television and dreaming of a day that is cooler but not fall (or worse, winter) yet. 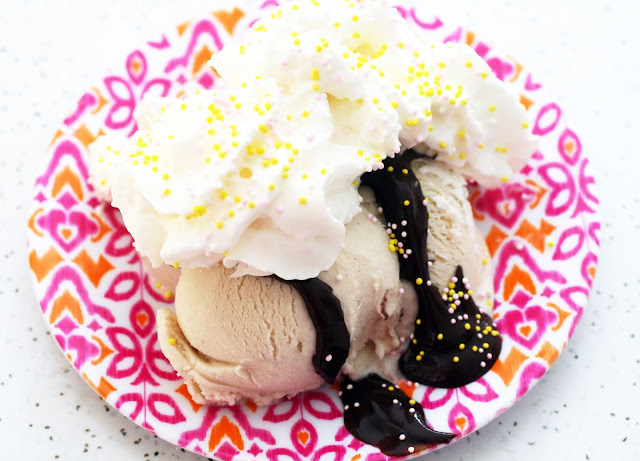 That gelato should be topped with whipped cream (from a can, let's be real) and sprinkles and drizzled with the most adult chocolate syrup one can make in 5 minutes. Alternately, swirl this coffee-packed, super dark syrup into a milkshake. You won't be sorry.